If you're in search of a casual yet absolutely chic getup, team a navy blazer with an Asos lace pencil skirt with peplum hem. Both items are totally comfy and will look fabulous together. When it comes to footwear, this outfit pairs nicely with navy suede pumps. If you're in search of a casual yet chic getup, rock a white crew-neck sweater with an Asos lace pencil skirt with peplum hem. Both pieces are totally comfy and will look fabulous together. Rock a pair of tan canvas low top sneakers to make the ensemble current. If you don't like being too serious with your combos, try teaming a mustard crew-neck sweater with an Asos lace pencil skirt with peplum hem from Asos. Kick up the cool of your outfit by complementing it with brown leather pumps. If you're searching for a casual yet totally chic ensemble, wear a navy print crew-neck sweater and an Asos lace pencil skirt with peplum hem. Both garments are totally comfy and will look fabulous paired together. Bump up the cool of your getup by wearing black leather pumps. If you're hunting for a casual yet stylish look, reach for a grey hoodie and an Asos lace pencil skirt with peplum hem. Both items are totally comfy and will look fabulous paired together. Navy canvas high top sneakers will add a sportier vibe to your outfit. 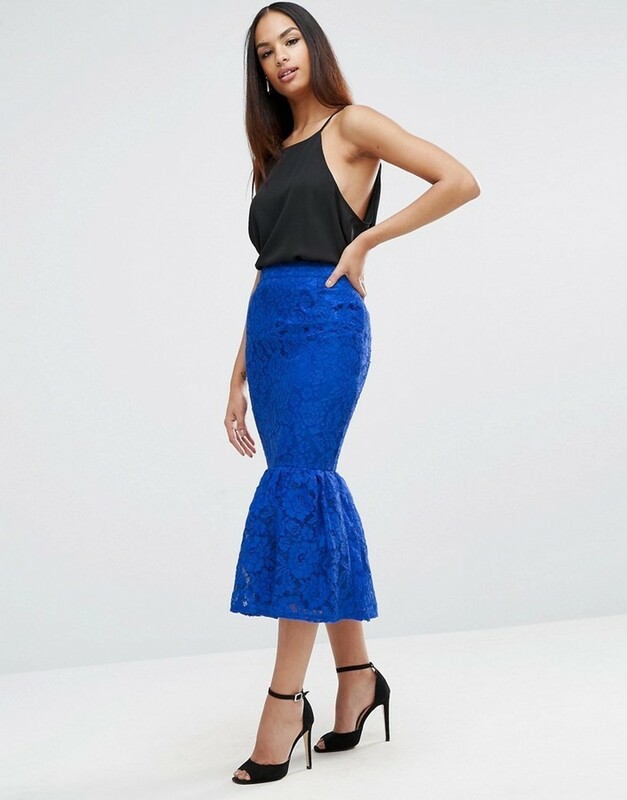 If you're scouting for a casual yet totally chic look, reach for a grey crew-neck t-shirt and an Asos lace pencil skirt with peplum hem from Asos. Both garments are totally comfy and will look fabulous together. Bump up the cool of your look by finishing off with black and white leather pumps.